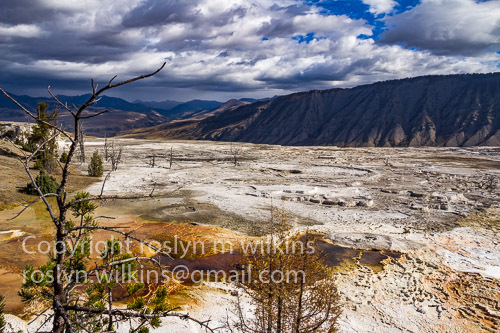 Out first stop in Yellowstone National Park was at Mammoth Hot Springs. I seriously felt like I had just stepped out of the space craft on to the surface of another planet. I really like this scene above of a photographer in this photographer’s paradise. 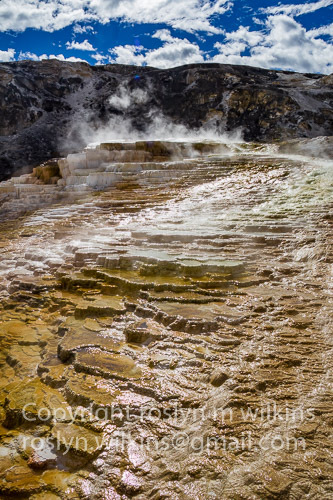 According to the National Park Service website: Travertine terraces are formed from limestone. 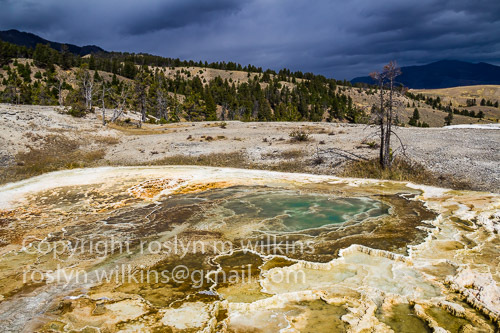 Thermal water rises through the limestone, carrying high amounts of the dissolved limestone (calcium carbonate). 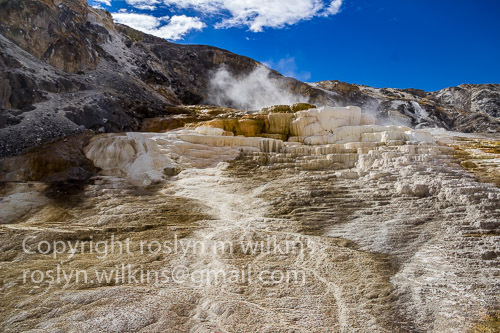 At the surface, carbon dioxide is released and calcium carbonate is deposited, forming travertine, the chalky white mineral forming the rock of travertine terraces. The formations resemble a cave turned inside out. Colorful stripes are formed by thermophiles, or heat-loving organisms. I’ve been in love with travertine ever since I led the Marble Masterpieces tour for the Los Angeles Conservancy for many years. So it was pretty amazing to see it forming under my feet. I love reflections and random objects and making connections, so this combination of live trees reflected in the water and a dead tree in the foreground spoke to me. These unexpected opportunities are why I enjoy photography. 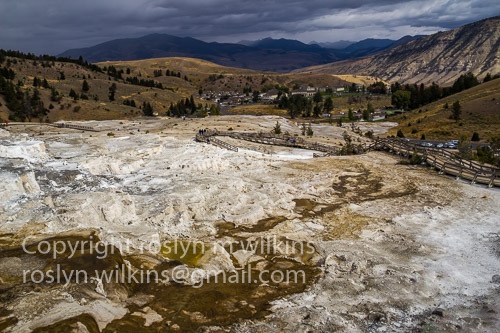 From the National Park Service website: Mammoth Hot Springs are a surface expression of the deep volcanic forces at work in Yellowstone. 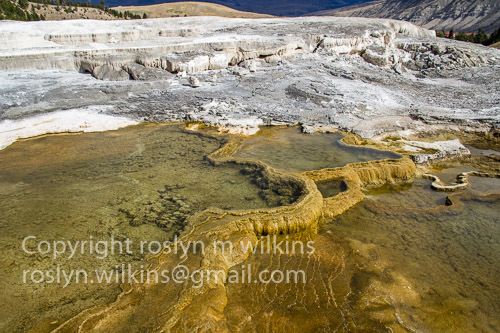 Although these springs lie outside the caldera boundary, scientists surmise that the heat from the hot springs comes from the same magmatic system that fuels other Yellowstone thermal areas. In the center you can see the Historic District. 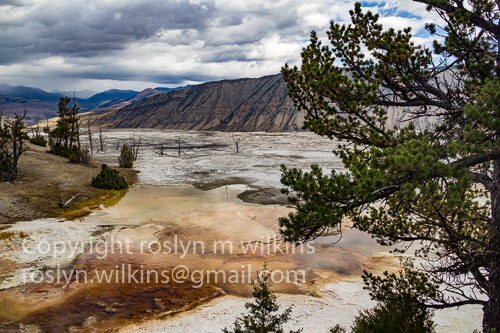 From the National Park Service website: The Mammoth Hot Springs Historic District includes Fort Yellowstone, where 35 structures remain from the 1890s and early 1900s when the US Army administered the park. Significant conservation policies were developed here that led to the origin of the National Park Service. 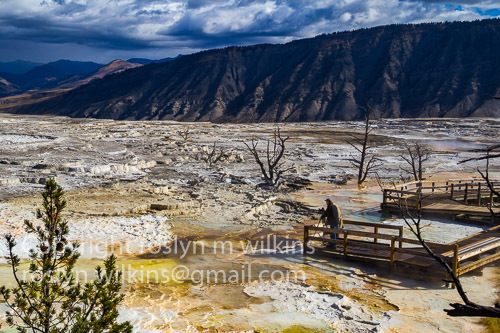 The Mammoth Hot Springs Historic District has statewide significance as the administrative and concession headquarters of the largest national park in Wyoming. Fort Yellowstone is also listed as a National Historic Landmark District, the highest designation. 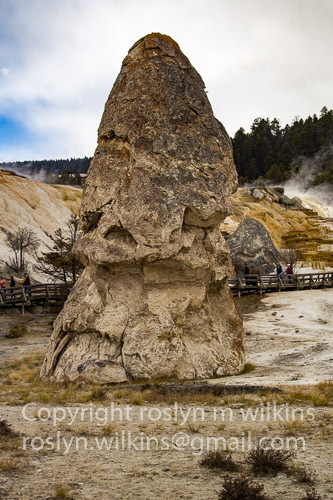 This last guy is called Liberty Cap, formed by a steady flow of hot water emerging from a single source which deposited layers of travertine. The cone continued to grow as long as there was a source of water which evidently dried up. 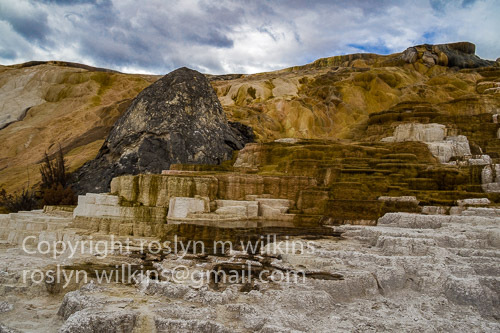 All photos and content copyright roslyn m wilkins unless otherwise noted. No commercial usage without express permission. Please feel free to pass along this post via email or social media, but if you wish to use some of our images or text outside of the context of this blog, either give full credit to myself and link to One Good Life Travels, or contact us for proper usage. Thanks! 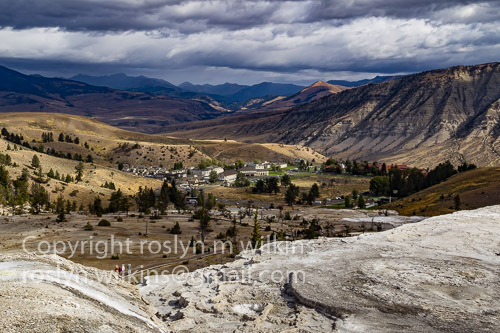 I agree Roslyn, it does look like another planet. Your photographs are amazing…many look like paintings. I’m in awe over the sky…so beautiful. Thanks for sharing! We don’t get such dramatic skies in Southern California so it was a real treat. 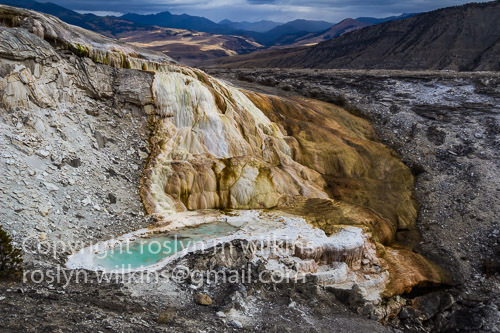 I really enjoyed your photos and the travertine explanation, Roslyn. A very beautiful and unique place on earth. It certainly is, Jet, and so thrilled I finally was able to visit. You clearly showed us how out of this world this fascinating and remarkable this place really is. Excellent photography! 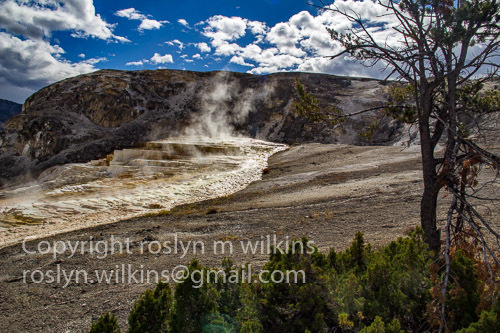 I will so miss Yellowstone if i leave US without seeing it…i so want to see it! But i do hope of coming back to see it! You absolutely have to see Yellowstone and the Grand Tetons. Wow! Such dramatic views beautifully “frozen in time”! Thanks. My photos will bring back memories for years to come. It is indeed a gorgeous place. I found it was difficult to not take stunning photos there. So happy you got to see the beauty. I agree, I couldn’t stop clicking the shutter! 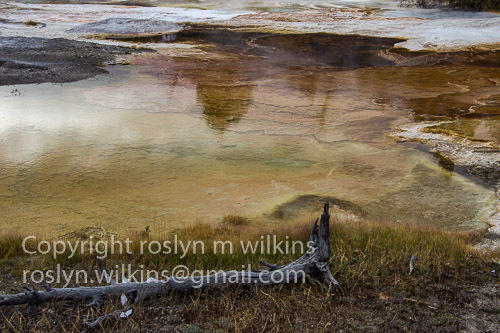 You have a terrific talent for landscapes Roslyn, they are spectacular, they are all so good. I just visited your Smugmug, it looks beautiful. 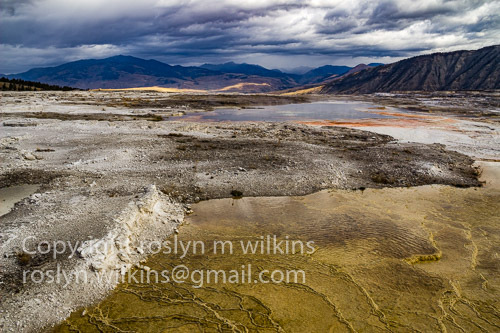 Which lens are you using for these landscapes? Thank you, Maria. My go-to lens 90% of the time is the Canon zoom kit lens 18-135mm. I once asked a sales guy at the camera store if I should invest in a better quality lens. He said absolutely not, the lens I had was capable of taking terrific pictures… so I saved my money! I print at 13×19 (32×48 cm) and 16×20 inches (41×51 cm) and the detail is amazing. Which printer are you using? Maria, I have a Canon Pro 100 to print at 13×19 with the Lightroom Creative Cloud printer software. I also calibrate my screen with colormunki. 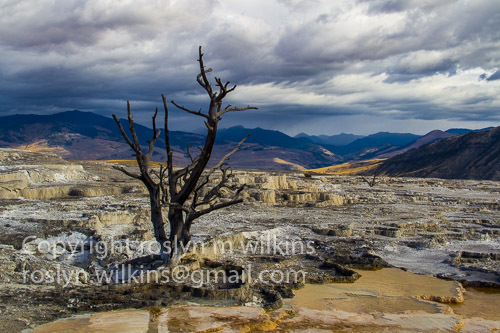 I was sending my photos out for a while to print on canvas at 16×20 but now I prefer to print my own slightly smaller. It took me a while to get the colors and tone to my liking but now I know what I’m doing it’s pretty straight forward and I’m very happy with the Pro 100.
great images of a spectacular place.